When you consider Disney's penchant for producing live-action remakes of their animated classics, and the massive success of their most recent blockbuster, The Jungle Book, it was probably inevitable that they'd get around to The Lion King at some point. The Mouse House has just announced that the film is in the planning stages, and that Jon Favreau will return to the directing chair. Plus, they confirm that a sequel to The Jungle Book is also in development. "We can officially confirm that The Walt Disney Studios and director Jon Favreau are putting a new reimagining of The Lion King on the fast track to production. The project follows the technologically groundbreaking smash hit The Jungle Book, directed by Favreau, which debuted in April and has earned $965.8 million worldwide. The Lion King builds on Disney’s success of reimagining its classics for a contemporary audience with films like Maleficent, Cinderella, and The Jungle Book. The upcoming Beauty and the Beast, starring Emma Watson as Belle, is already one of the most anticipated movies of 2017. Like Beauty and the Beast, The Lion King will include songs from the animated film. Disney and Favreau are also in development on a sequel to The Jungle Book. No release date has been announced for either film." The Lion King is one of the highest grossing animated pictures of all time, and is generally considered to be one of the best. When Disney began their live-action remake spree, fans expressed concern that Simba and co. might be on their to-do list - but after the terrific job he did on The Jungle Book, it's hard to imagine we'll get too many complaints with Favreau at the helm. 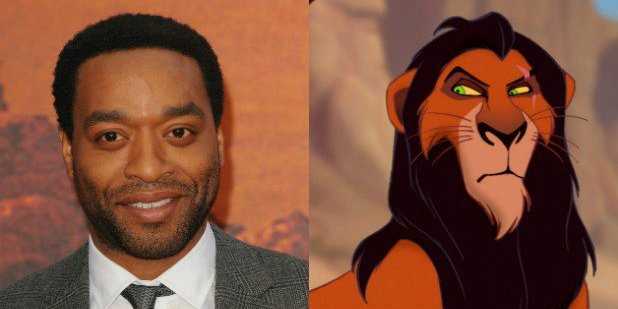 It looks like Chiwetel Ejifor will be providing the voice of Scar in Jon Favreau's upcoming remake of Disney classic, The Lion King. In the original, Scar was Simba's power-hungry uncle who ultimately wound up murdering his own brother, Mufasa, and pinning the blame on his nephew. The character was voiced by Justice League's Jeremy Irons to great effect in the animated version. Around the time of SDCC, a rumor arose that Logan star Hugh Jackman was in line to play Scar, but this was recently shot down by the actor's representatives. Ejiofor joins Donald Glover as Simba, James Earl Jones as Mufasa, Seth Rogen as Pumba, Billy Eichner As Timon, and John Oliver as Zazu. Last I checked, the Lion King didn't really have any people in it. So a live action film would essentially be 100% CG, which i would consider a form of computer animation. so this is just a remake of the Lion king with updated animation? I'm guessing similar to how the Jungle book was done. Except the Jungle Book did have some human actors, as did Beauty & The Beast. Walt Disney Studios is bringing The Lion King to life next year, and we finally have our first glimpse at what the leader of Pride Rock will look like when the movie finally arrives. A Twitter account called Disney Film Facts has taken to the social media site to share photos from the production of The Lion King, revealing the first look at the live-action version of Simba's father, Mufasa. A behind-the-scenes photo from Disney's upcoming live-action remake of The Lion King has been shared by director Jon Favreau. The film, first officially announced in 2016, is just one of several remakes of animated classics on the Disney film docket. After the moderate success of films such as The Jungle Book (which was also directed by Favreau), the studio has continued to churn out remakes of its most successful properties. The Lion King, which came out in 1994, is one of the most beloved of these classic children's films. The tale of a lion cub, Simba, who runs away after his father is killed and the creatures he befriends along the way is loosely based on Othello, but has perhaps become best known for its Oscar-winning soundtrack scored by Hans Zimmer (who's also on board this time around). The remake has attracted a lot of big talent, and, with the film less than a year away, anticipation is mounting. Now, Favreau has released an image from backstage. In it, he and three other bearded men stand in a recording booth: Seth Rogen, Donald Glover, and Billy Eichner. 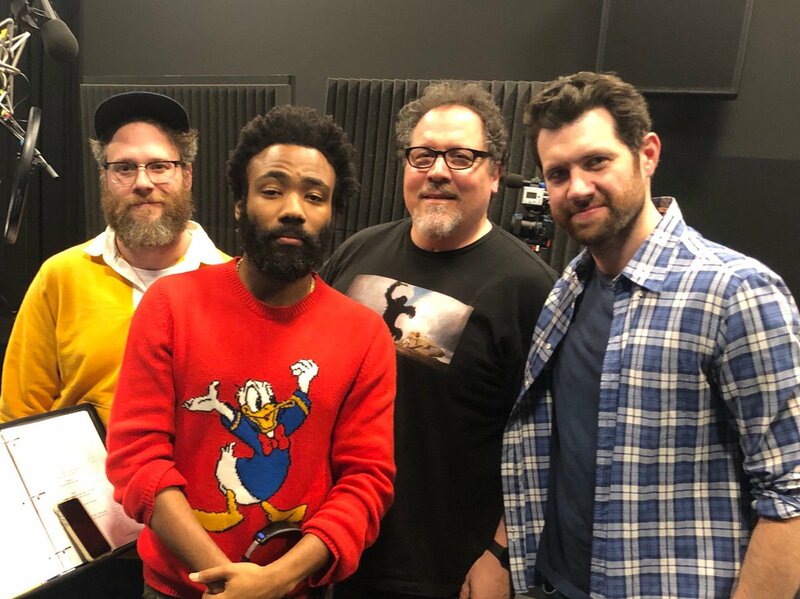 Rogen and Eichner have been confirmed to be voicing Simba's pals Pumbaa and Timon, who are a warthog and a meerkat, respectively. As for Glover, he's the star of the show, playing Simba. Glover is even giving a shout out to the studio, wearing a sweater featuring the Disney character who shares his first name, Donald Duck. As exciting as the image is, it's not the first Favreau has given fans. Last year, in December, he shared a photo with just Glover and himself, along with the text "Simba returns!" This past summer, fans were treated to a host of images that were of an animatronic Mufasa; however, they were misattributed, actually belonging to a German creature designer. Since the movie doesn't hit theaters for quite some time, though, it might be awhile before fans get a first look at the CGI characters. But Disney fans could be in for plenty more surprises over the next several months prior to the film's summer 2019 release. The star-studded cast, which also includes Chiwetel Ejiofor as the evil uncle Scar, Alfre Woodard as Simba's mother, Sarabi, and James Earl Jones reprising his role from the animated flick as Mufasa, chances are Favreau (or others) will share a glimpse of them recording their lines at some point. For now, fans will have to patiently await the first teaser trailer. Disney’s Lion King remake proudly stresses its similarities to the original movie, but it needs to change how its hyena villains are characterized. 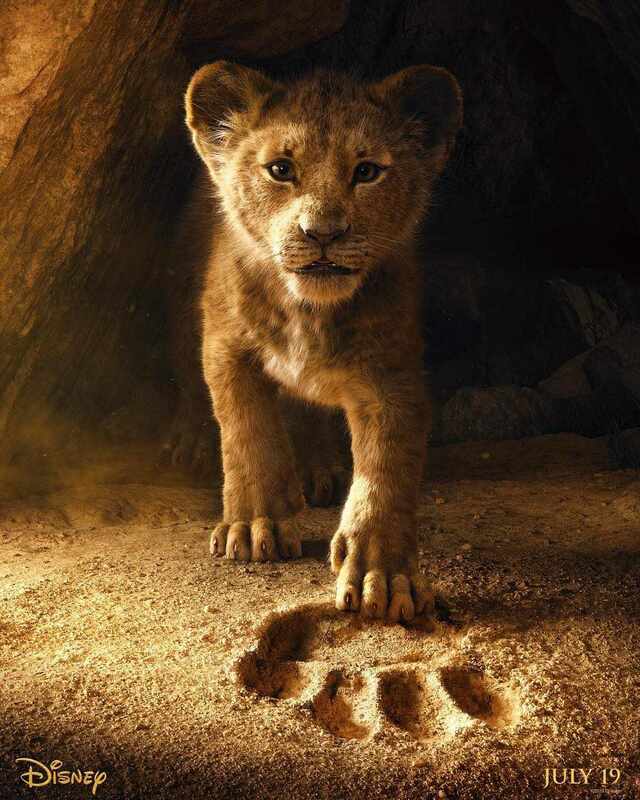 Already one of Disney's most popular trailers, The Lion King’s first teaser has been praised the detail of its photo-realistic CGI, and how well James Earl Jones’s voice-over captures the spirit of the animated classic. However, there are already several noticeable differences in Jon Favreau’s The Lion King when compared the original animation, from Rafiki’s design to Simba’s roar. And many observing film fans will be hoping that the hyena’s portrayal will have been similarly amended. When the villainous Scar seizes control of the Pride Lands, he does so by allying with Shenzi, Banzai, Ed, and the rest of a large hyena pack. The trio of hyenas serves as the occasionally-sinister-but-mainly-bumbling henchmen that typically populate Disney movies, similar to Pain and Panic in Hercules, Kronk in The Emperor's New Groove, and Iago the parrot in Aladdin. But ever since the animated movie was released, critics have recognized how The Lion King’s hyenas contain racist undertones and stated that they perpetuate harmful stereotypes. Shenzi (Whoopi Goldberg) and Banzai (Cheech Marin) and are the only hyenas who speak in the animated movie. The casting of an African American woman and a Mexican American in these two antagonistic roles has been highlighted by critics, with particular attention paid to how the “street” dialects of the characters are heavily emphasized, and their pelts noticeably darker. This is in stark contrast to the rest of The Lion King’s ensemble where, aside from James Earl Jones as Mufasa, the heroes are predominately played by white actors, with English/American registers. Their characters also have lighter, brightly colored markings. Furthermore, lions and their allies are portrayed as intelligent, noble and resourceful beings. On the other hand, the hyenas are brutal and dim-witted creatures. They require Scar’s leadership to be an effective hunting force. While in nature it is true that lions and hyenas do compete for food and territory, studies have highlighted hyenas’ intelligence and stated that their survival skills are as sophisticated as a lion's. Certainly, the hyenas’ human characteristics in The Lion King seem even more dubious when considered in the context of the film’s plot. They live segregated in the elephant graveyard until Scar orchestrates his plot. They later claim Pride Rock and its territories, but under their rule, the area is desecrated and ruined. It is only when Scar is defeated and the hyenas are expelled that Pride Rock can flourish and restore its bounty. Many have supposed that a drought – and an imbalance, caused by Scar’s allegiance – were the main factors in this desolation of Pride Rock. However, that doesn’t explain the hyenas’ harmful depiction throughout the rest of the film. This is the kind of incendiary subtext that will be scrutinized upon the remake's release. Put simply, it isn’t appropriate for a movie being released in 2019. Thankfully, there are indicators suggesting that Disney and director Jon Favreau will be addressing these issues in some way with their new take on The Lion King. Every Disney live-action remake (thus far) has attempted to remove their original stories' shortcomings. Moreover, Maleficent, Beauty and the Beast and Cinderella have augmented the occasional passiveness of their protagonists. The end results are films which foreground female empowerment far more than their animated counterparts. Beyoncé Knowles's casting as Nala in The Lion King remake signals that her role might be similarly expanded upon. In tackling the movie’s racial issues Favreau appears to have taken notes from The Lion King’s wildly-successful stage adaptation. The remake consists of an overwhelmingly black cast, including the aforementioned Beyoncé, Donald Glover, Chiwetel Ejiofor and Alfre Woodard among its primary line-up, while Eric Andre, Florence Kasumba and Keegan-Michael Key are providing the voices for the hyenas. Nuances like this make for a far more suitable take on this Savannah-based story and its characters. It's worth also noting that Favreau also removed the negative aspects from The Jungle Book’s antagonist Shere Khan in his 2016 retelling. Played by Idris Elba, this version of Khan contained none of the original’s harmful gay-coding. Whether Favreau does the same for Scar remains to be seen. But, considering how the hyenas are the most egregious part of the animated Lion King, it's their depiction where it most matters.